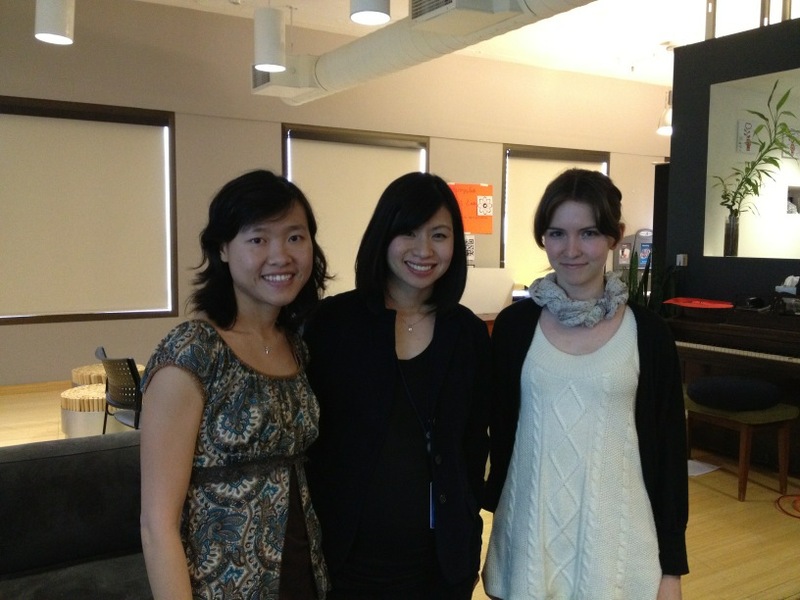 Monkey Write won Grand Prize in Galaxy Note App Challenge! When Samsung announced the Galaxy Note S Pen App Challenge in February, not one, not two, but five of my friends send me the link to make sure that I enter Monkey Write into the contest. It's such a natural fit that I got to work right away. I studied the S Pen SDK to see what I can do with it. The core of the API is the CanvasView, which is a canvas that accepts and renders touch events. It comes with a SettingsView to change the pen style. Another interesting feature is the animation mode for replaying the whole stroke sequence. To minimize code change, I layer the CanvasView on top of my stroke sketching area, and pass all the touch events down for grading purposes. The CanvasView handles all the drawing, which means that I can take advantage of the nice pen styles provided by Samsung. Once the character is finished, I animate all the strokes again, so you can review the stroke sequence and direction before moving to the next character. These enhancements made Monkey Write quite a bit nicer, but I was hesitant to release them, for the S Pen SDK adds 1MB to my binary, which is quite a lot since the base apk is only 1.9MB. I was not sure if it was a good idea to force everyone to download an extra 1MB that only benefits the Galaxy Note users. Turns out the S Pen SDK is enabled for all Samsung devices, not just the Galaxy Note, so a lot more people ended up using Monkey Write with beautiful pen styles and engaging animation. A few days before the contest winners were announced, I got an email from ChallengePost, asking me to verify my name and my company. I was thinking, hey, looks like I would be on some kind of list, and nobody keeps a losers' list, right? I tried not to think too much about it, but needless to say I was rather excited. April 23 was announcement day. I was on vacation with my family in Hong Kong, and we went for a short trip to Macau. When I woke up on April 24, I went down to the hotel lobby and checked email on one of the public machines. I was staring at my inbox for quite a long time to make sure I read it right, and yes, Monkey Write won Grand Prize! Monkey Write has been such an amazing experience for me. Both HTC and AT&T have been really supportive, from hackathon to launch. Users have told me time and again that they really enjoyed the app, some by writing 5-star reviews, others by buying extra workbooks. On top of all that I now have the great honor of being the winner of the Samsung Galaxy Note Contest. This is simply amazing. Thank you so much for showering Monkey Write with love! When Sara Haider invited me to be the keynote speaker at the April Twitter Engineering Summit, I thought there must be a mistake somewhere. Woah, keynote? Also, why would they want a non-Twitter person speak at a Twitter event? We met over dinner to discuss the details, and she explained that the engineering summits are hosted by Twitter, but they are public events for the local tech community, so they want a mix of Twitter and non-Twitter speakers. I was thrilled to be invited, but I wasn't sure what I should talk about. I told her my various conferences, and she was intrigued by the mobile caching talk I was giving at Philly ETE. We decided to have caching as the overall theme, and Sara arranged two more caching talks for the evening. Yesterday I showed up at Twitter HQ 20 minutes before the event, ready to hook up my laptop. The very organized Sara already loaded up my slides, and had the clicker set up, ready to go. My preparation then became filling my stomach with food so I would not get hungry while I speak. Easy enough. I would be the first one speaking, followed by Lien Mamitsuka, then Sarah Brown. Lien would cover caching concerns such as security and data corruption, and Sarah would talk about web caching. I just gave this talk in Philadelphia last week, so I was very comfortable on stage. Even though it was a rerun, the audience made everything different. The San Francisco crowd laughed at different things than the Philadelphia crowd. They noticed different things when I pulled up my "spot the difference" slide. I found myself emphasize on different things as well, based on the nods I got from the audience. It was interesting. Q&A time came after all three of us spoke. Sarah got most of the questions, followed by Lien, and I got none. I wonder if it was because Sarah went last, or my talk was so high-level that nobody had any questions? I got a few question at Philly ETE, mostly people who were already writing mobile apps and asked about their own situations. Maybe the SF crowd was more web-centric, that's why they had more questions for Sarah? 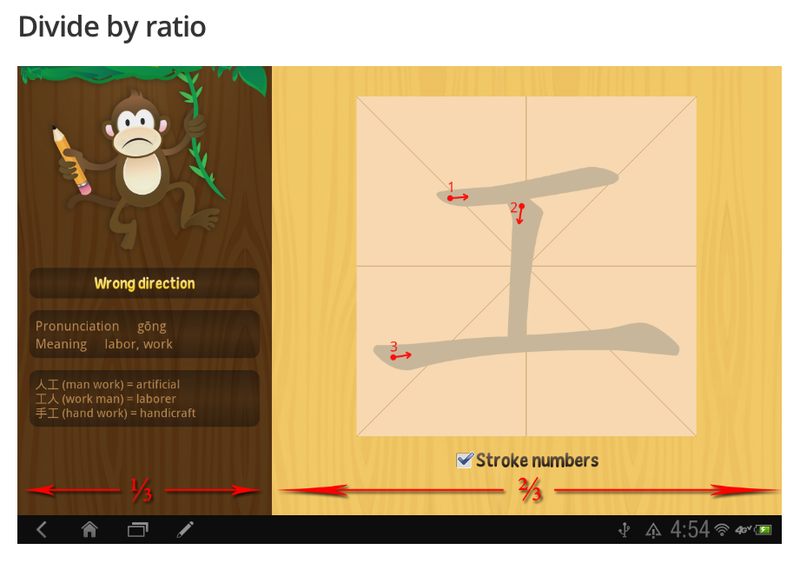 Monkey Write works on both phones and tablets, but because it's targeted to children, the user experience on tablet screens is quite a bit better. Amazon Kindle Fire and Barnes and Noble NOOK are both 7-inch Android e-readers, and since reading and writing goes hand in hand, I thought their users will enjoy Monkey Write. They each have their own marketplace, so I needed to resubmit my app. I started the application for both the Kindle and the NOOK around the same time, but the NOOK process was so tedious that the Kindle version went live a few weeks earlier. Amazon Appstore has an approval process, with an average turn around time of a day per submission. 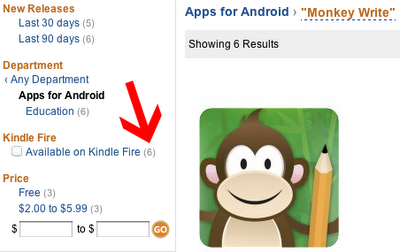 I cut a few corners when I launched the first version of Monkey Write, and the Amazon folks caught them pretty quickly. One shortcut I took was to fix the device orientation: portrait for phones, landscape for tablets. That way I don't have to save state when Android destroys and re-create your activity upon orientation change. That caused my app to have a problem on Kindle Fire. According to the review message, "the ink disappears upon entering and exiting hibernation". I had to file a ticket to understand that hibernation is the lock screen. So it seems like the Kindle Fire, the activity is destroyed and re-created when the screen is locked. Once I found out that problem I just patched the app and resubmitted. Besides the orientation change, I needed to make another patch. I direct the user to the appropriate marketplace to download workbooks. On the Kindle it goes the Amazon Appstore. Otherwise it goes to Google Play. But I did not consider the situation when the Amazon Appstore is installed on a phone. Amazon stipulates that all downloads go through their appstore even when Google Play is also available, but my code preferred Google Play. The fix was fairly easy, unlike the orientation change fix which took quite some time. Overall the approval process was pretty good. My only complaint is that I only get notified when my app is approved for the general Amazon Appstore, and it needs a second approval specifically for the Kindle Fire. That's fine, but I don't get notified when the second approval comes along, meaning I have to resort to checking on the website obsessively. Look on the left sidebar. Check the count for "Available on Kindle Fire". If the count is smaller than expected, click the checkbox to see the subset that is approved for the Kindle Fire. Getting into the Amazon Appstore was smooth sailing compared to the NOOK store. I already had quite an adventure when I submitted Puzzle Pal to the NOOK store. I had to go through the whole process again because I wanted to publish Monkey Write under a business account instead of a personal account. I wanted to launch simultaneously on Google Play and NOOK, so I applied for a business account right before I was publishing to the Google Play store. Well, that got me rejected because they only accept developers who has already published apps in other app stores. Which is a bit silly, given that I have published Puzzle Pal on their own store! You are a commercial company submitting the request. You have a US Bank Account and Tax ID. You have developed a commercial application and/or have deployed an application already to an existing marketplace or application store. Your company, vision or applications are aligned to a reading centric audience who are using the NOOK Color in the US market. You are committed to assign the necessary resources and have firm plans to deliver your apps now for NOOK Color. At this time your submission to us did not have evidence of one or several of the requirements listed above and therefore we regret that we are not able to progress your current request at this time. We do however encourage you to resubmit based upon this criteria. To be honest I had no idea what they wanted. I had my bank account number and tax ID ready to go, but there was no where to put it in the approval form. Point 3 was OK since I have already published Monkey Write to Google Play. Now, is a writing app aligned with a reading centric audience? I think so. Am I committed? Oh yeah, but how do I show that? This is the time when I'm very glad that I already got through the process with Puzzle Pal, because I ended up filing a ticket under my personal account requesting help for my business account to be approved. You see, before you get approved as a developer you don't have access to their ticket system, so you don't really have a recourse. The rep on the other side was really helpful, and approved my business account right away. Phew! 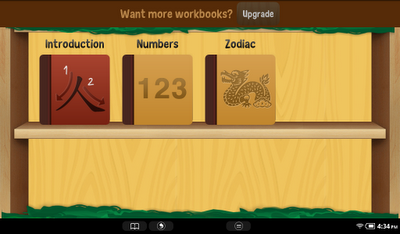 Once I got my account setup I uploaded the main app, plus additional apps for the workbooks. My main app went through the metadata-then-apk approval process uneventfully, but it took 10 days to go live because they only push apps once a week. The metadata for the workbooks all got rejected, though. Essentially they don't allow module downloads, breaking my freemium business model. I filed a ticket to complain. The rep was actually pretty funny. He said he knows I won't like his answer, but they don't allow freemium business model. He even told me that he knows the pain I went through to get a developer account, and he assured me that if I rebundle my app to trial/paid model it will work really well. And that's what I did. I put all the workbooks into a single app, give it a price tag of $19.99, and put it on the NOOK store: http://www.barnesandnoble.com/w/books/1109941306. I am providing lifetime updates as new workbooks get published, so I thought $19.99 is a pretty good deal. Very happy to know that the NOOK users agree with me, because a few of them have bought Monkey Write already! The Amazon Appstore is much more mature than the NOOK store, and the approval process is much smoother. The flip side is that the NOOK store does not have as many apps, so there is less competition in terms of app discovery, resulting in more downloads. Both of them required patches, but in my case it was worth the extra work to reach a brand new set of tablet users. Have you published Android apps? Where? What is your experience? I would love to hear your stories! After my public speaking debut at Ignite Where 2012, I flew to Chicago to give my first public tech talk at WindyCityGo, with an onward ticket for Philadelphia to speak at Philly ETE. The first day of WindyCityGo was quite heavy on iOS development. Some of the talks went right over my head, since they tried to alleviate the pain in certain tools for building iOS apps, and I was not similar with the tools themselves. I was worried that other people would feel the same way for my talk, if they did not have an Android background. My talk was scheduled for 9:30am the next day. There was some technical problems with projecting from my computer. Fortunately my slides were online, so we just switched to the computer already attached to the screen. Before jumping into the slides, I polled the audience. I wanted to know how many of them uses an Android phone, how many have written an Android app, and how many have written iOS apps. To my relief a third of them have already written Android apps, so I knew they would appreciate the technical details I already put in my slides. To make sure the other two thirds wouldn't get too lost, I spent a few extra minutes on the first few slides, explaining the basics. WindyCityGo was single track, with 15 minutes between sessions for speakers to get ready. I really liked that format. Everyone was in the same room, so I went around and introduce myself to tons of people. The flip side was that I was so busy talking that I forgot to take photos of the conference. Oh well. I will just put a slide with a monkey here to break up the paragraphs. I used a lot of screenshots in my talk, since it was about Android layouts and I needed to illustrate how I applied various design principles. When I practiced my talk, the screenshots did not project well. The contrast was too high to differentiate the details. I really dreaded adjusting the contrast of the images one by one, but then I realized that I had HTML5 slides, I could just adjust the opacity with a CSS class. That had the additional advantage that I could adjust it live for different screens. I ended up not adjusting anything because WindyCityGo used flat screen TVs instead of projectors, but I was glad that I was ready to deal with it. Here are the slides for my talk: Fluid Android Layouts. If you are curious about the rest of the conference, here is an excellent summary. I hanged out with some friends in the Chicago suburbs for the weekend, and flew to Philadelphia on Monday for Philly ETE. The conference organizers gave me a room in the conference hotel, which was super convenient. On Tuesday I went down to the ballroom for the keynote, and was shocked to see the number of people. It was a huge conference! To warm up the audience, I asked people to move to the front of the room. No one actually moved, so I joked that one of the slides had a really complicated flowchart, and they could not blame me of they could not see the details. I made fun of the back of the room a few more times during the talk, and people laughed, which was great! I love it when my audience react. A nod, a smile, anything to indicate that they were paying attention. ETE stands for "emerging technologies for enterprise", so this is a much broader conference than WindyCityGo. As a result I tried to stay high level on my talk, aiming to provide a framework for thinking about mobile caching. This was all fine and good, except I could not talk high level principles for 45 minutes. To be frank I was panicking as the conference date drew close. I used Monkey Write as an example for applying to principles, so I thought, hey, I could just include more examples! It worked out really well, because the case studies demonstrated the nuisance in implementing the various caching tiers. I had a great time giving these two talks! I always worried that people will be bored, but as long as a few people nod and smile, I know somebody is learning something, and that energizes me to no end. Poll your audience to gauge background knowledge level. Adjust your introduction accordingly. Be lighthearted. They won't laugh at all your jokes, but when they do, it's super rewarding. 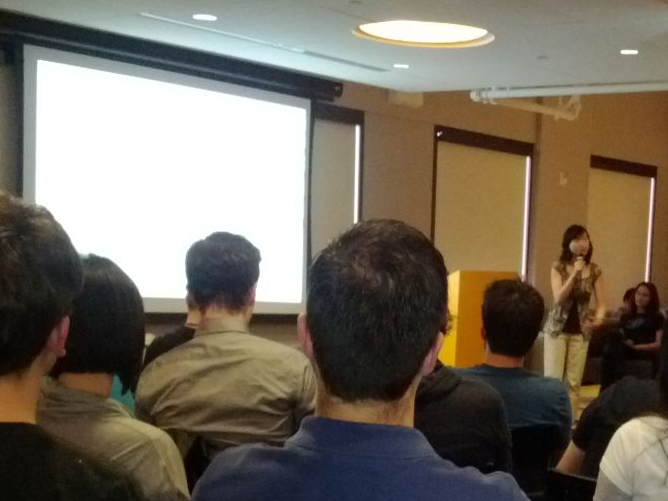 I will be giving the mobile caching talk again at the Twitter Engineering Summit on April 17. Come and say hello if you are in the San Francisco Bay Area! I got a postcard for a free O'Reilly ebook at some event, and it was sitting on my desk until I read the sample chapter for Confessions of a Public Speaker by Scott Berkun. A good speech is both informative and entertaining, and Scott seems to be able to do both, so I used the postcard to get the ebook. The energy of the room, and hence your speech, depends on the density of the crowd, not the number. If there is not enough people to fill the room, gather them to the front and center to make a tight crowd. Set the pace by telling people your outline in the beginning. I used to think this will make the talk boring by killing the surprise element, but then I realized that my surprises usually only span over 2 slides, so a high-level outline shouldn't do any harm. The outline helps people orient themselves, and knowing pace helps people stay focused. Finish early. People who are interested to hear more from you will stay around, the bored ones will move on. Everybody is happy. I was on chapter 9, and I could sense that the book was going to end soon. But according to my Kindle I was only at 55%. Turns out there was a rather long appendix to the book, with tons of practical tips and funny anecdotes. My favorite part is the diaster stories from various speakers. Someone realized last minute that he was expected to lecture in a language that he does not speak. Someone got a tiny audience because Linus Torvalds was speaking next door. Someone's tie caught on fire. The stories are so funny that I had to suppress my laugh so I won't disturb the guy sitting next to me on the plane. I love that part because it lets me know that even if my speech goes wrong, worse things can happen. More importantly, the anecdotes reinforce my belief that storytelling is the core of all communications, writing and speaking alike. It's a bit hard to tell stories in a technical talk, so I find myself showing lots of real-life examples to illustrate high-level principles. I give this book 5 stars out of 5. It's funny and informative, and as an aspiring speaker I am both inspired and educated. Recommended. Did you know that the term "speaking circuit" originated in 1800s, when it was literally a single circuit around the country and speakers like Mark Twain travelled along it on horses? Today the speaker circuit is a figure of speech (pun intended) as there are so many different way to spread information, and it would be silly to put all the speakers on the same route. My personal speaking circuit started at San Francisco last night, when I spoke at Ignite Where. I was invited last Wednesday, and needed to come up with a topic quickly, so I went meta and talked about talking! Ignite has a very rigid format: 5 minutes with 20 auto-advancing slides, 15 seconds each. To prepare for the talk, I made slides out of little pieces of paper and timed myself with a wrist watch. It was hard to get the timing right. Sometimes I would go under, sometimes I would go over. The worst was when I went under and marched ahead into the next slide, and misremembered the sequence. I practiced maybe 6 or 7 times, and concluded that I would not transition to the next slide until the auto advancing happened. That way I know for sure what is on the next slide! Ignite was at 7pm last night. There were 12 speakers, and we talked back to back. I was really, really nervous. Normally I am fine rambling on for 20 or more minutes, but the auto-advancing slides made me feel out of control. I was second to go on stage, and the talk actually went pretty well! A few people approached me today, telling me that they loved my talk. Not bad for my public speaking debut! Tomorrow I'm flying to Chicago to speak at WindyCityGo, and next week I will be in Philadelphia for Philly ETE. Both of them are tech talks, so they won't be as entertaining. But I hope people will love them just the same!